The #7 Seward Lady Saints came ready to shoot. 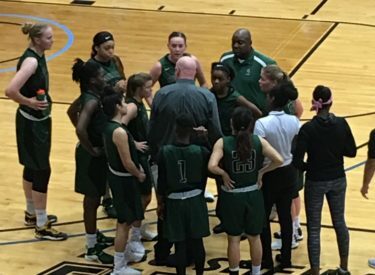 The “Gals in Green” made 16-32 three pointers on their way to an 83-64 win at the Kirkman Center in Great Bend on Saturday night. Mollie Mounsey tied for third is SCCC history for three pointers in a game with seven (7-12). She scored a career high 30 in Seward’s sixth consecutive win at Barton. Seward led 25-24 after one and 46-37 at the half. Seward led by as many as 21 on their way to the win. The Lady Saints made 53 percent of their shots and were 5-6 at the free throw line. Barton was 8-16 from three and shot 42 percent from the field. Barton out-rebounded Seward 35-26. Mounsey poured in a career high 30. Neidy Ocuane had 17 points with eight assists and four steals. Brennyn Seagler scored 15 with eight rebounds. Erin Richardson added 11. Seward is 20-1 and 16-1 in the Jayhawk Conference. This marks the 25th consecutive season SCCC had won 20 or more games. Barton is 11-10 and 8-9 in the Jayhawk. Seward hosts Pratt Wednesday night at 6 in the Green House. Saints Shootaround begins at 5:45 on 107.5 and kscbnews.net. First National Bank is the buyout sponsor.